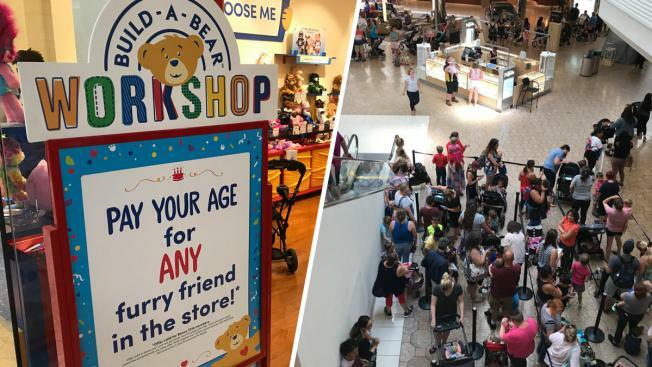 After Build-a-Bear Workshop offered customers the chance to pay their age for any stuffable animal, the company was forced to close its lines at all U.S. and Canadian workshops as "extreme crowds" filled shopping centers and throngs of people wrapped around stores and buildings. The company said in a statement on its website that the response to the company's first-of-its-kind sale "has been overwhelming and unprecedented in our 21-year history." It added that at the request of local authorities, the company cut off lines and stopped accepting new customers at stores over safety concerns. This resulted in "long lines, extensive waits and disappointed guests." Some lines were shut down after stores had only been open a few hours. Build-a-Bear said the crowds "greatly exceeded our expectations." With kids and adults hoping to get a customizable animal for cheap, social media posts showed local workshops stuffed with eager customers and lines spilling into the hallways of malls. In New York City, parents with small children were still waiting in line at the 34th Street shop at 1:30 p.m., telling NBC4 they had been there since 6:30 a.m. Some said once inside the store they waited hours just to purchase a bear. One woman yelled "We need somebody" as she confronted staff members over what she said was a lack of monitoring people who were skipping the line. "It was not worth it," one child said after a long wait. The Otay Ranch Town Center in Chula Vista, California, posted Build-a-Bear's statement to its Facebook page and customers replied confused and upset. "The store or the mall should give out vouchers for customers to return at a later date to obtain their bear. Seems a bit unfair, and both entities should have prepared for a response like this when offering this type of promotion," one Facebook user wrote on the post. Video from NBC7 showed a sprawling line stretching out of the town center's doors and wrapping around the back of the building. In Illinois, police could be seen responding to the growing crowd at Orland Square Mall, NBC Chicago reported. A flood of people could also be seen at Oakbrook and Woodfield Malls. Though the lines were long, NBC5 reported customers received their discounted bears without incident. In response to the chaos, Build-a-Bear gave vouchers for future purchases to guests who were present in lines but were not served. Vouchers were also made available online to Build-a-Bear Bonus Club members in the U.S. and Canada. Those members must log on to their accounts by midnight July 15 and use the voucher by August 31. The sale allowed customers to choose any of the "furry friends" available at local workshops and pay their age number for it. The company said no one would pay more than $29 for a bear on the special date — regardless if the purchaser is in their 30's or older. Build-a-Bear required no identification or proof of age. Many of the animals are normally in the $20-30 range, with some costing as low as $10 and some as high as $75. The day-long event was set to serve as a kickoff for a larger, year-round celebration of birthdays in which those 14 and under can receive a "Count Their Candles" invite. Kids can pay their age for a special bear during their birthday month. The discount was also being offered at U.K. stores. Police said lines formed at a workshop in England "about a mile long," the BBC reported. Several stores closed for the rest of the day due to the crowds. Parents reported wait times of up to nine hours in at some locations in England, according to DailyMail.com. "We have overwhelming data that indicates Build-A-Bear is synonymous with childhood, and nearly one-third of our sales are associated with birthdays," said president and chief executive officer of Build-A-Bear-Workshop Sharon Price John.